The Alfa Romeo 4C (Type 960) is a mid-engined, lightweight, rear-wheel drive sports car. Available in coupé and spider body style, it uses a carbon fiber tub, front and rear crash box, and hybrid rear subframe mainly out of aluminum to keep weight at 895 kg (1,973 lb) and 1,050 kg (2,315 lb) in the United States. The 4C is Alfa Romeo's first mass-produced vehicle of the 21st century to re-enter the North American automotive market. Alfa Romeo 4C Concept is a two-seater, rear-wheel drive coupé with technology and materials derived from the Alfa Romeo 8C Competizione, with 1750 turbo petrol engine with direct injection, the "Alfa TCT" twin dry clutch transmission, and the Alfa DNA dynamic control selector. The 4C concept version unveiled in the 81st Geneva Motor Show in March 2011, followed by Mille Miglia 2011 parade, Goodwood Festival of Speed 2011, 2011 Frankfurt Motor Show. It was displayed for the first time outside in Concorso d'Eleganza Villa d'Este in 2012. Compared to the production version, it is very similar, with the biggest differences being front lights, side vents and mirrors. The Alfa Romeo 4C Concept was voted the 'Most Beautiful Concept Car of the Year' award by the readers of German magazine Auto Bild, and won the Auto Bild Design Award 2011. It was awarded the "Design Award for Concept Cars & Prototypes" by referendum of the public in Villa d'Este. The production car was unveiled at the 2013 Geneva Motor Show, followed by 2013 Essen 'Techno Classica', Goodwood Festival of Speed 2013, Moscow Raceway, 2013 Frankfurt Motor Show. The bare '4C000' chassis was also shown at the 2013 Geneva Motor Show. Ordering of European models began in October 2013 at Alfa Romeo dealerships in Europe. As part of Alfa Romeo 4C launch, Alfa Romeo Style Centre and Compagnia Ducale designed a 4C IFD (Innovative Frame Design) Bicycle, inspired by the Alfa Romeo 4C coupé. The vehicle went on sale in December 2013 and marketed in Europe, Asia and America. Production of 4C began May 2013 at Maserati's plant in Modena, with an expected production of up to 2500 units per year. It will be the first mass-produced Alfa Romeo car for re-entry into the US market. Production of Alfa Romeo 4C was originally estimated to be over 1000 units per year, with an upper limit of 3500 units per year, depending on the quantity of carbon fiber chassis that can be built by the supplier Adler Plastic. Within the 3,500-unit quota, 1,000 units of which are earmarked for Europe. Delivery of European Alfa Romeo 4C Launch Edition took place at Balocco (Vercelli, Italy) Test Centre, with vehicles delivered to Pierluigi De Silvestro (Switzerland), Philippe Walch (France), Carlos Diniz (Germany), Aldo Mariani (the Netherlands) and Stefano Zanotti (Italy). The entire carbon-fiber monocoque chassis ("tub") of the car weighs a mere 143 lb (65 kg). Front and rear aluminum subrames combine with the tub, roof reinforcements and engine mounting to comprise the 4C chassis giving the vehicle a total chassis weight of 236 lb (107 kg) and a total vehicle curb weight of just 2,465 lb (1,118 kg). The 4C has a single carbon fiber body, similar to the body of many supercars. The outer body is made of a composite material (SMC for Sheet Moulding Compound) which is 20% lighter than steel. The stability is comparable to steel and better than aluminium. The 4C employs double wishbone suspensions at the front and MacPherson struts at the rear. The resultant weight distribution is 38% on the front and 62% on the rear axle. Wheels and tyres have different diameters and widths front and rear: 205/45 R17 front and 235/40 R18 back as standard, with optional 205/40 R18 and 235/35 R19. Both wheel options come equipped with Pirelli P Zero tires. The 4C uses vented disc brakes on all wheels; Brembo 305 millimetres (12.0 in) on the front and 292 millimetres (11.5 in) on the rear. The car can stop from 100 km/h (62 mph) in 36 meters. To save weight and increase steering feel, the 4C has no power steering. Its center of gravity height at just 40 centimetres (16 in) off the ground is 7 centimetres (2.8 in) lower than the Lotus Elise. The 4C uses a new all-aluminium 1.75 L (1,742 cc) inline 4 cylinder turbocharged engine producing 240 horsepower (180 kW) at 6000 rpm. The engine has been designed for minimum weight. The engine's combined fuel consumption 6.8 L/100 km (42 mpg‑imp; 35 mpg‑US). 0–62 miles per hour (0–100 km/h) acceleration is achieved in 4.5 seconds and the top speed is 258 km/h (160 mph), the power-to-weight-ratio being just 0.267 hp/kg (8.22 lb/hp). A journalist from Quattroruote car magazine demonstrated how the 4C accelerates from 0–100 kilometres per hour (0–62 mph) faster than 4.5 seconds. In race mode, with left foot on the brake pedal, if you pull the right shift paddle the engine will rev to 3500 rpm, but if you also pull the left paddle the engine will rev to 6000 rpm and 0–100 kilometres per hour (0–62 mph) time will go down to 4.2 seconds. Italian car magazine Quattroruote published the lap time of 4C around Nurburgring. It lapped the ring in 8:04. The 4C is equipped with a six speed Alfa TCT Dual Dry Clutch Transmission, and can be operated via gearshift paddles on the steering wheel. It also has an Alfa 'DNA' dynamic control selector which controls the behavior of engine, brakes, throttle response, suspension and gearbox. In addition to the modes already seen in Giulietta, the 4C has a new "Race" mode. The 4C Launch Edition was a limited and numbered edition, unveiled at the vehicle's launch at the 2013 Geneva Motor Show. The vehicle came in a choice of four paint colours (Rosso Alfa, Rosso Competizione tri-coat, Madreperla White tri-coat or Carrara White matt). 400 examples were reserved for Europe, Africa and the Middle East, 500 for North America and 100 for the rest of the world (88 delivered to Australia—in Rosso Alfa and Madreperla White only). Distinguishing features of the Launch Edition were carbon fiber trim (including headlight housings, spoiler and door mirror caps), rear aluminium extractor with dark finishing, Bi-LED headlights, dark painted 18-inch front and 19-inch rear alloy wheels, additional air intakes on the front fascia, red brake calipers, racing exhaust system, BMC air cleaner, specific calibration for shock absorbers and rear anti-roll bar, leather/fabric sports seats with parts in Alcantara and a numbered plaque. Alfa Red coloured cars got matching red stitching on the steering wheel, handbrake, mats, handles and sports seats. In Europe the vehicle went on sale for 60,000 euros including VAT. The US version of 4C was introduced in the 2014 New York International Auto Show with the first 100 4C's being shipped to the U.S. early July, with a total of 850 being shipped by the end of 2014. The US model includes extra bracing and strengthening required to meet U.S. crash regulations (including aluminium inserts in the carbon fiber chassis), resulting in 100 kilograms (220 lb) of weight increase. This version also has new headlamps similar to those seen before in the 4C Spider version. The Spider version of the 4C was previewed showing a pre-production prototype at the 2014 Geneva Motor Show. Sharing its engine with the Coupé version, the 4C Spider has different external parts such as the headlights, exhaust and engine hood, as well as a different roof section that features a removable roof panel. Alfa admits it has had to make some strengthening tweaks to the 4C to cope with the removal of the top, with the net result being a 45 kg (99 lb) weight increase (dry weight 940 kg),. In the US, the weight difference is listed at only 22 lb (10 kg), however (2,465 lbs: 2,487 lbs). Top speed is quoted at 257 km/h (160 mph) and acceleration at 4,5 seconds to 100 km/h (62 mph). Novelty to 4C range is an option of yellow colour for Spider. Limited version 2018 (108 cars) introduced in Geneva Motor Show 2018, finished in matte Vesuvio Grey, with carbon details on the roof, rear spoiler, mirror caps, side air vents and headlight moulding. 1st introduced in 2018, limited edition only 108 for European markets. For US markets Limited edition 2020 model (only 15 cars) version has Misano Blue Metallic paint, front air intake and rear diffuser are Piano Black. A special Spider Italia emblem adorns the rear fenders, and the design features the Italian flag. The inside has an aluminum 4C Spider Italia plaque on the center console. On September 12, 2013, Alfa Romeo 4C (with Pirelli P Zero Trofeo tyres) driven by Horst von Saurma completed the Nürburgring Nordschleife circuit in 8 minutes 4 seconds. The Alfa Romeo 4C has been used as official safety car of the SBK Superbike World Championship since the 2013 season, except at Laguna Seca, where another Fiat product, the Dodge Challenger, is used, owing to Fiat traditionally giving the Dodge brand exposure since the Alfa Romeo was not available in the United States at the time. A private tuning and racing firm, Picchio S.p.a. , created a limited production race prepared Alfa Romeo 4C. The Alfa Romeo 4C Picchio is powered by a new 4-cylinder turbo 1750 cc with 600 horsepower (CV) with a Hewland sequential semi automatic gearbox at steering wheel controls and suspensions redesigned for use with the Pirelli PZero 13 inch tires. The car is fully race prepared with FIA certificate and contains the mandatory roll cage, cut-off switches, and with all interior removed bar a new bucket seat and race harness. The prototype of this car is being used in Italian Hilclimb events, though customers can specify to have their own car built to order at a price of 296.000 euro. Joint "Overall Best Car" award in the Sunday Times Ireland/CompleteCar.ie Best Cars Guide 2015 and "Best Driver’s Car Under €75,000"
What Car? Reader Award for "the most exciting car to be launched in 2013"
^ Perez, Jeff (2018-06-27). "Alfa Romeo 4C Coupe Gets The Axe, But The Spider Lives On". motor1.com. Retrieved 2019-02-11. ^ "How the Alfa Romeo 4C Came Together". insideline.com. Retrieved 2011-03-03. ^ a b "Specs". alfisti.net. Retrieved 2013-03-09. ^ a b c d e f "Efficiency". 4c.alfaromeo.com. Retrieved 2013-03-09. ^ "2013 Alfa Romeo 4C specifications, information, data, photos 319693". Carfolio.com. Retrieved 2013-12-15. ^ a b "4C launch". alfaromeopress.com. Retrieved 2013-03-05. ^ "World Premiere: the Alfa Romeo 4C Concept". Alfaromeopress.com. 2011-03-01. Retrieved 2013-12-15. ^ Noah Joseph RSS feed. "Geneva 2011: Alfa Romeo 4C Concept shows us what matte(rs)". Autoblog.com. Retrieved 2013-12-15. ^ "Alfa Romeo 4C Concept at the "Mille Miglia 2011" parade". Alfaromeopress.com. 2011-05-11. Retrieved 2013-12-15. ^ "Mefistofele, Alfa Romeo and Alfa 4C Concept historic models: these are the stars of the "Goodwood Festival of Speed 2011"". Alfaromeopress.com. Retrieved 2013-12-15. ^ "Alfa Romeo at the 64th International Motor Show in Frankfurt". Alfaromeopress.com. Retrieved 2013-12-15. ^ "Alfa Romeo wins prestigious awards in Germany and Italy". Alfaromeopress.com. 2011-05-31. Retrieved 2013-12-15. 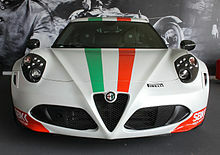 ^ "Alfa Romeo enjoys success in Villa d'Este with the 4C and the 1933 6C 1750 GS". Alfaromeopress.com. 2012-05-28. Retrieved 2013-12-15. ^ Noah Joseph RSS feed. "Alfa Romeo takes top honors at Villa d'Este". Autoblog.com. Retrieved 2013-12-15. ^ "World première: Alfa Romeo 4C". Alfaromeopress.com. 2013-02-12. Retrieved 2013-12-15. ^ "Alfa Romeo 4C: German preview at the Essen 'Techno Classica'". Alfaromeopress.com. 2013-04-10. Retrieved 2013-12-15. ^ "The 4C compact supercar and six magnificent classic Alfas to star at the Goodwood Festival of Speed 2013". Alfaromeopress.com. 2013-07-10. Retrieved 2013-12-15. ^ "The new Alfa Romeo distribution network to kick off in Russia". Alfaromeopress.com. Retrieved 2013-12-15. ^ "Alfa Romeo Giulietta MY 14 at the 2013 Frankfurt International Motor Show". Alfaromeopress.com. Retrieved 2013-12-15. ^ "Production start Alfa Romeo 4C again a bit closer". Autoedizione.com. 2013-03-29. Retrieved 2013-12-15. ^ a b "Alfa Romeo 4C: 'just drive'". Alfaromeopress.com. Retrieved 2013-12-15. ^ "Alfa Romeo introduces the exclusive 4C IFD bicycle". Alfaromeopress.com. 2013-09-24. Retrieved 2013-12-15. ^ Noah Joseph RSS feed. "Alfa Romeo rolls out the 4C of bicycles". Autoblog.com. Retrieved 2013-12-15. ^ "New organizational and industrial structure for Maserati" (PDF). Fiat SpA. 2012. Retrieved 2012-04-12. ^ "Alfa Romeo & Jeep: iconic brands to play globally" (PDF). Fiat SpA. 2011. Retrieved 2011-09-17. ^ "Alfa Romeo 4C: excellence made in Italy". Alfaromeopress.com. 2013-06-11. Retrieved 2013-12-15. ^ "Alfa Romeo 4C is a 'masterpiece". Retrieved 2014-07-26. ^ "15 03 2013 – Il Mattino: Scudieri apre Adler: ad Airola i telai in fibra di carbonio per l'Alfa 4c" (PDF). Retrieved 2013-12-15. ^ "Alfa 4C per il mercato Usa: nasce la scocca in carbonio". Adlergroup.it. Retrieved 2013-12-15. ^ a b "The first European Alfa Romeo 4C 'Launch Edition' units are delivered at Balocco". Alfaromeopress.com. 2013-10-31. Retrieved 2013-12-15. ^ Paul Horrell (2011). "Exclusive: the Alfa Romeo 4C draws nearer". topgear.com. Retrieved 2011-12-17. ^ "Nuova Alfa, telai in carbonio: a gennaio parte la produzione" (in Italian). Il denaro.it/. Archived from the original on 2013-04-08. Retrieved 2012-11-16. ^ SHillis (2013-08-19). "Automaker Alfa Romeo Uses CNC Machines to Create the 4C | CMS North America Blog". Cmsna.com. Retrieved 2014-05-29. ^ "World Premiere: the Alfa Romeo 4C Concept". alfaromeopress.com. Retrieved 2011-03-02. ^ "Alfa Romeo 4C – The technical sheet". socialnetwall.alfaromeo.com. Retrieved 2011-03-02. ^ "Geneva 2011: Alfa Romeo 4C Concept shows us what matte(rs)". autoblog.com. Retrieved 2011-03-01. ^ "Tires". autoedizione.com. Retrieved 2013-03-11. ^ "Suspension". 2014-02-04. Retrieved 2016-06-05. The Lotus Elise has a kinematic roll center height of 30mm above the ground and a center of gravity height of 470mm. The Lotus Elise RCH is 6% the height of the CG, meaning 6% of lateral force is transferred through the suspension arms and 94% is transferred through the springs and dampers. ^ "World première: Alfa Romeo 4C". alfaromeopress.com. 2013. Retrieved 2013-02-25. ^ Carlo Bellati (2013). "alfa romeo 4c prova su strada" (in Italian). quattroruote. Retrieved 2014-01-02. ^ "Alfa Romeo 4C Laps Nurburgring in 8:04". topspeed.com. Retrieved 2013-09-22. ^ "Alfa Romeo 4C Concept". CoverCars. 2011-08-30. Retrieved 2011-09-02. ^ Knight, Robert. "18 Alfa Romeo 4C TBi SA (2014)". Flickr. Retrieved 25 March 2019. ^ "World première: Alfa Romeo 4C Launch Edition". Alfaromeopress.com. 2013-03-05. Retrieved 2013-12-15. ^ "Price". Archived from the original on 2013-06-20. Retrieved 2013-06-12. ^ "Alfa Romeo 4C an 'appetizer' for brand's U.S. return". usatoday.com. Retrieved 2014-04-17. ^ "Alfa Romeo 4C Spider preview to debut at Geneva 2014". Alfaromeopress.com. 2014-03-04. Retrieved 2014-07-22. ^ "Phwoar: it's the Alfa 4C Spider". topgear.com. Retrieved 2014-07-26. ^ Bruce, Chris (2019-02-07). "2020 Alfa Romeo 4C Spider Italia Debuts In Misano Blue Paint". motor1.com. Retrieved 2019-02-11. ^ Joseph, Noah (21 October 2013). "Alfa Romeo confirms 4C's 8:04 Nürburgring lap [w/video] [UPDATE]". Autoblog. Retrieved 25 March 2019. ^ "Alfa Romeo still key player in the Superbike World Championship". Alfaromeopress.com. 2013-10-20. Retrieved 2013-12-15. ^ Post (2016-04-11). "Scheda tecnica Alfa Romeo 4C Picchio". Slideshare.net. Retrieved 2017-05-07. ^ "Auto:Cvm,presentata l'Alfa 4C Ar Picchio". ansa.it. 2016-04-09. Retrieved 2016-04-11. ^ "Alfa Romeo 4C Off to an Award-Winning Start in Ireland". Retrieved 22 October 2014. ^ "ALFA ROMEO 4C NAMED JOINT "OVERALL WINNER" IN SUNDAY TIMES IRELAND / COMPLETECAR.IE BEST CAR GUIDE 2015". Fiat Chrysler Automobiles. Press. 2 October 2014. Retrieved 22 October 2014. ^ "Alfa Romeo 4C Garners International Attention". Motoringview. 2 February 2014. Retrieved 10 February 2014. ^ ""Best Cars 2014" Das sind die Sieger unserer Leserwahl Insgesamt". Auto Motor und Sport. Retrieved 10 February 2014. ^ "Spain: Alfa Romeo 4C is 'Best Sports Car 2013' by 'El Economista'". Alfaromeopress.com. 2013-05-10. Retrieved 2013-12-15. ^ "Alfa Romeo 4C Wins 'Auto Trophy 2013'". WebWire. 27 November 2013. Retrieved 6 December 2013. ^ "Alfa Romeo 4C: Winner, Reader Award". What Car?. Retrieved 2013-12-07. ^ Waller, Jordan (12 December 2013). "The cars that made our arteries throb in 2013". FHM Magazine. Retrieved 12 December 2013. ^ "Alfa Romeo 4C named the most stylish car for 2016". Whichcar. 21 January 2016. Retrieved 25 March 2019. Wikimedia Commons has media related to Alfa Romeo 4C.